Many American cities were built up around major bodies of water, and those oceans, lakes and rivers often continue to shape the character of the city even in modern times. This is certainly the case with Washington, DC. The Potomac River is and has been as integral a part of the city and its landscape as famous institutions such as the White House, the US Capitol, the Lincoln Memorial, the Washington Monument or any of the Smithsonian museums. For that reason, when we are photographing brides, grooms or fiancés in the Washington, DC, area and we want to give the images a quintessentially Washingtonian feel, we try to find ways to incorporate the Potomac River into our wedding and engagement photography. One of the best places to get stunning pictures of fiancés and newlyweds with the Potomac River in the background is Georgetown Waterfront Park, a beautiful green space that has been carved out between the river and the hustle and bustle of Georgetown’s commercial district. The park has a lovely promenade along which couples can cuddle and kiss with the Potomac and Theodore Roosevelt Island, another famous Washington landmark, in the background. Engagement photography and wedding couples portrait sessions there are particularly magical at sunset. The view of the sun going down behind the Francis Scott Key Bridge (which connects Washington, DC, with Virginia) is among the best in the city. Not every marriage celebration in or around Washington, DC, takes place at locations that are near the Potomac River (like Georgetown Waterfront Park), of course, so when we have future spouses who hold their nuptials on the waterfront (like this lovely bride and groom), we make every effort to include the Potomac in the images that we capture. The wedding featured here gave us all the opportunities to take river-themed photographs that we could ever want. We took this lovely couple’s engagement pictures in Georgetown Waterfront Park and then came back a week later for their exchange of wedding vows, which was aboard one of the many Potomac River cruises that local boat companies offer. That meant that their entire marriage celebration took place within view of Washington’s most famous body of water. We got beautiful images of them putting wedding rings on one another’s fingers with the Lincoln Memorial and Washington Monument in the background and lovely photographs of they and their families toasting their nuptials as the river moved past below them. 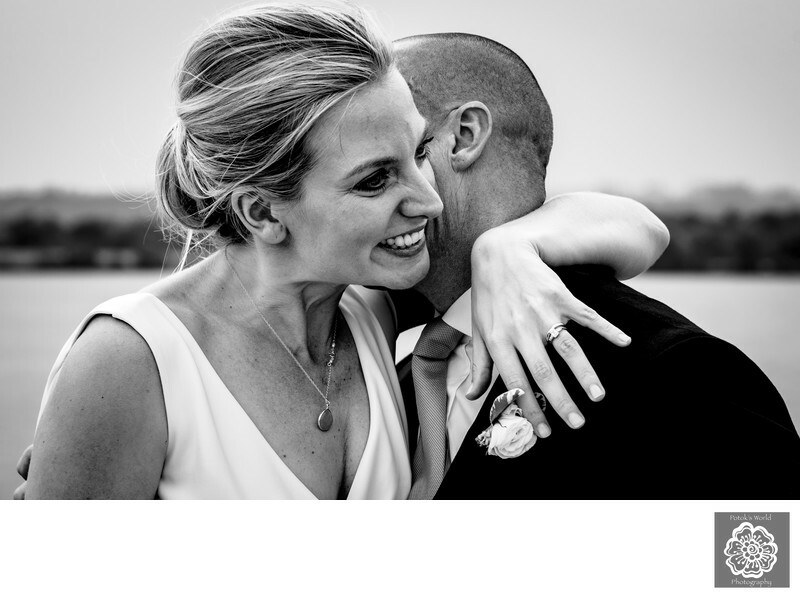 This particular snapshot was one of our favorites from the marital event, not only because the Potomac River is visible in the background, but also because of the body language of the newlyweds. Within moments of meeting this bride and groom, we noticed how much laughter was a part of their way in which they communicated their love for one another. During their entire engagement portrait session, they did not go more than a few minutes without breaking into laughter over some whispered word or another. So for the couples portraits portion of their wedding, we encouraged them to hold each other close and say whatever was in their hearts, knowing that we would get great photos of them smiling and laughing. Like this one! Location: Georgetown Waterfront Park, 3303 Water St NW, Washington, DC 20007.